No, this is not a misspelled naughty French word. Zizzi is the name of a pizzeria chain in the UK - there are about 3 dozens of them in London alone -one of them a 15-minute walk from our hotel, so we decided to go there for our lunch on the day we arrived, Thursday 17th. We got there around 1 o'clock, and it was extremely busy (recession? what recession?). It was a big, buzzy, modern place. I enjoyed staring at all these business people around us, who seemed to have the time for a long lazy lunch with their friends. As it was so busy, service was quite slow - we waited about 40 minutes for our starter, a disappointing fried squid. But our main course was served promptly after that, and it was delicious. Brendan had read somewhere that their pizzas are good, but the rest not so much, so we played it safe. Brendan had the Diavola (spicy of course), while I had the Trentino (with smoked ham, mozzarella and rocket). We both opted for the Rustica option - thinner, crisper and bigger. Much bigger. It was huge, but we were hungry. Well, that's my excuse anyway. Afterwards, we had a stroll around the Little Venice area - yes there are canals in London. Apparently the area at the back of Paddington Station (Paddington basin) is being redeveloped. I guess the area where Zizzi is, Sheldon Square, Paddington Central, is already part of this development. But it's hard to imagine that, with the current economic climate, there will be much more work in the area in the foreseeable future. It's not long since I finished reading the book - and now the movie. The Swedish version, that is. I saw somewhere that there is an American film at the planning stage, but I can't imagine how an American version would work. We went to see it at the IFI (great spot for free WiFi by the way), and I was expecting a full house, but far from it - there were plenty of empty seats. I enjoyed it - like the book, it's a long movie (152 minutes). It's quite faithful to the book. All the main turning points are exact replicas, including some quite horrifically graphic scenes. Some elements are not explored in any detail in the movie, like Blomkvist's relationship with Erika Berger and with Cecilia Vanger (that would have added another hour to the movie without progressing the action in any meaningful way, so I think it was a good decision). Some things have been changed completely - in the book, Blomkvist's investigation into Harriet Vanger's disappearance is kept secret to the rest of the family - the official story is that he is writing a family history; in the movie, on the other hand, it's all in the open, and there is even a family meeting where his investigation is discussed by all. Also the circumstances of Martin's death are very different. And there is a crucial scene added at the end, which explains a lot about Lisbeth Salander (the girl with the dragon tattoo) and her outlook on life. Not a hint of that in the book. And I'm 3/4 of the way into the 2nd book and that past history still hasn't been uncovered at all. In a way, that's a spoiler in the movie. They should warn people not to watch that scene if they haven't finished reading the trilogy! 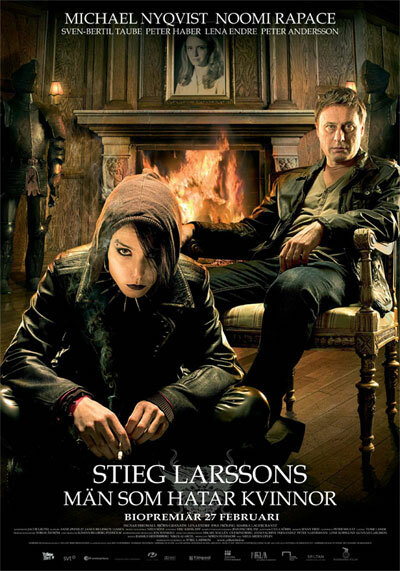 The actress who plays Lisbeth Salander is spot on, and Mikael Blomkvist (Michael Nyqvist) is excellent too (if a bit older looking than I had expected - he looks very familiar, but I've never seeen any of the movies he's been in). I found that Erika Berger was a lot older-looking than I had imagined, and not as attractive really. A bit of trivia: Noomi Rapace, who plays Lisbeth Salander, apparently got her nose and her eyebrow pierced for the movie, but the huge tattoo she sports on her back is not real (that would have been an extreme way to get into the role!). I have to give a mention to Lorna's chocolate cake (it's called "Really Fudgy Chocolate Brownies") - it's one of the highlights of our stay in London. Perfectly moist. Perfectly chocolatey. Just Perfect. At last, an outfit that works - simple black dress, wide golden belt, simple gold bangle. Beautiful! I do like a good lemonade - sharp and refreshing. Nothing else can quench my thirst quite so effectively. So I was delighted to find excellent lemonade in the cafeteria of the Science Museum in London last week. Lemon, water, sugar - nothing else. I'm just sorry I didn't take note of the brand! Jean Byrne - blue satin dress + leather jacket? The dress is quite nice, I think, but the leather jacket really doesn't go with that style! 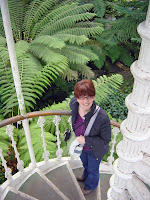 We visited Kew Gardens last Thursday. It's one of these places we had heard about a lot, but never been to. 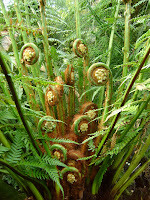 A few years ago (a good few years ago), there was a program about Kew and its gardeners, on the BBC I think, probably on a Friday evening. They talked about various aspects of the gardens, the greenhouses, the seed bank program, planting summer bedding, ...It was very good television, even if you were not into gardening . We had lovely weather for it - it brightened up nicely and got quite warm. Spring is late this year, so there was probably not as much in bloom as you'd normally expect by mid-March - crocuses were out, but daffodils were only barely starting, and the cherry blossoms looked completely dormant. We walked down towards the Japanese tower, then had a look at the green-houses - temperate and tropical. We also had a look at the Evolution House, which has a few beautiful ferns (not much else, but these ferns were worth the detour). We also walked the Xstrata treetop walkway, much to my horror. I'm not too bad with heights (well, I'm not great really, but I can manage), but I just didn't trust this structure to carry me safely. First of all, the lift is out of order (or "continues to remain out of order" as per the board at the entrance - maybe not the exact words, but you get the drift). Now, if they can't manage a simple lift, how can I trust that the rest of the structure is not going to collapse from under my feet (even if it was designed by the same architects as the London eye - note the term "designed", not "built")? The pillars looked solid enough, but the metal meshing used as steps/walkway material didn't inspire my confidence, particularly as it bounced or popped if you stepped in the middle of the round corner platforms. So, I held on to the wooden bannister the whole way round. Thankfully there were not too many others up there, so nobody to think I looked really silly (except Brendan of course, who even filmed me - and, no, I'm not sharing that little movie with you lot). One final note - if you're expecting peace and quiet in the middle of the city, you'll be disappointed - while the tweety birds were singing their hearts out, planes landing in Heathrow were flying right across the gardens every 2 or 3 minutes. As always, Brendan did his research before we left for London, and found a Burmese restaurant on Edgware Road, not far from our hotel. Mandalay doesn't look like much - a small, fairly basic place, but the food was very good. We had never eaten Burmese food before - according to their website, it's a mix between Indian, Chinese & Thai. I'm not sure I detected an influence from any of these cuisines - it was quite unique, in my experience anyway. We had fritters for starters - I had shrimp + bean sprouts, Brendan had shrimp + vegetables. The batter was nice and light (it's made from rice flour, wheat flour and gram flour) but it was quite filling. I think next time I would try a salad or a soup - I find that there is a sameness to food fried in batter. Our main courses were much more distinctive in flavour. I had a stir fry with shrimp and ginger, and I think Brendan had a chilli chicken. Both really nice and nothing like anything we'd eaten before. We were full after that, so we skipped dessert. The place is small and looks really cheap, but it was clean (except, apparently the yard you have to cross to get to the bathrooms - it was full of builders' rubble and rubbish bags. The bathrooms themselves were clean). There was a nice buzz around the place - most tables were occupied by the time we left, mostly by British and European customers, and a few Asians. Next time we're in London, I wouldn't mind trying out a few other dishes on their menu. We were in London for the last few days - encouraged by good value Aer Lingus flights and a favourable exchange rate. We stayed in the same hotel as last year, the Shaftsbury Metropolis on Sussex Gardens - Brendan had signed up for their loyalty card and we got upgraded to a club room - a lot more space, and a bathroom with a bath (instead of the tiny bathroom where you couldn't swing a cat). And this time, we got breakfast included - we were expecting a greasy English breakfast, but we were very pleasantly surprised - a nice buffet, with fresh fruit salad, cheese, hams, and hot foods too. I really enjoyed my daily helpings of orange+pomegranate juice, fruit salad + banana + plain yogurt, toast + cheese +honey + egg sunny side up, and green tea. The only item I found disappointing in the breakfast range was the pain au chocolat. So I didn't have it again, which is probably just as well, as we were not starving. 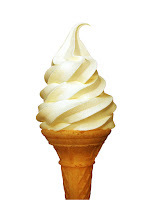 While looking for a picture of an ice cream cone, I came across this site: www.icecreamireland.com. If you like icecream, you will love it. It's written by Kieran Murphy, who, apparently, makes a lot of ice cream, and looks like he loves his job. Next time I'm in Dingle, I'll be looking for his shop! 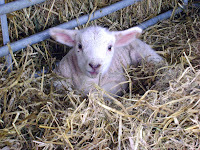 And don't forget to check all the links he's gathered - an amazing source of information and inspiration for all foodies. I may not be posting much about my artwork these days, but that doesn't mean I haven't been busy. No watercolours lately. I'm currently working on an acrylic. It's based on a photograph I really like, but I'm struggling to achieve the soft striation effect. 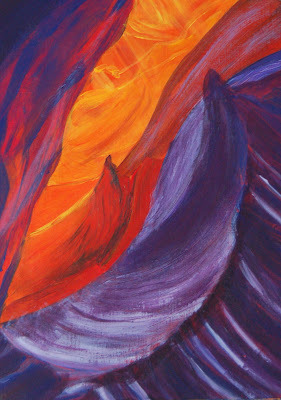 So far, the only part of the painting I'm happy with is the orange canyon background. The foreground is still too rough. Maybe I should try it in watercolour and see where that takes me. I'm also experimenting with the swirling shapes with my Faber Castell Pitt pens - if I can't get them right with pen and paper, there is probably no chance in acrylics. In the photograph, I love the way the little peak in the centre reminds me of an ice cream cone. But I can't seem to get that part right. Anyways, this is where it is right now. Plenty more work before this is finished. 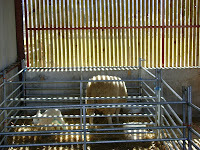 3 kids (baby goats to you and me), lots of lamb, crocuses everywhere, huge piglets (they've grown so quickly), and every plant starting to pop out. Someone told us on Friday that the daffodils are 4 weeks late this spring. I'm not surprised - it's been so cold and dry (but very sunny over the last few weeks, so we're not complaining, except for my very dry hands). Today, finally, spring is in the air. Thank you Padraig and Mary for a lovely evening. Enjoyed the food and company. Busy Busy Run Run - not much time to write this week. 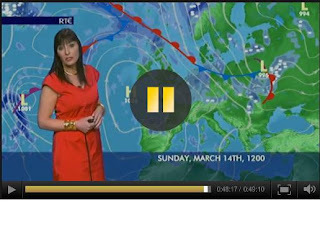 Jean Byrne was wearing a bright red dress last night - she carries it well. Note also the big gold bangle. She does wear rather large bangles - no dainty bracelets for her! Are these trousers? I think she looks better in a skirt. I like Fareed Zakaria, Newsweek's international editor. I always think he makes such sense. If political leaders read his writings more often, and tried to apply them, I think the world would be a better place. Read this article from him on how to resolve the debt problem. And yet, you know that Congress would vote against these measures, no matter how much sense they make. It's the same everywhere - elected representatives are incapable of doing what's right - they only care about getting re-elected, not the future for their children and grand-children. I can only imagine how frustrating this is for people like Obama, who are trying to do what's right for their country and are being blocked at every step of the way. I've just finished reading the Girl with the Dragon Tattoo (I'll return it next Friday, Mary) by Stieg Larsson. I found the first 50-100 pages hard going, and I very nearly put it down, but then the action picked up and it was a very enjoyable read. I don't normally read thrillers, but the unusual characters in this one kept me interested. I did guess the resolution about 20 pages before it was spelled out, but I hadn't a clue until then (maybe I'm not that bright after all). No wonder this has been such a bestseller. And the controversy with regards to his life partner's rights to his legacy has probably added to the sales. Clearly, we're not the only ones who have noticed Jean Byrne's unique dress sense. I found this picture on one of the online forums (mostly men discussing her by the way!) I actually think this is a very nice dress on her. And thank God they didn't try to cover her arms this time! Not sure about the black bandage around the arms..
Is she giving in to the studio bosses? 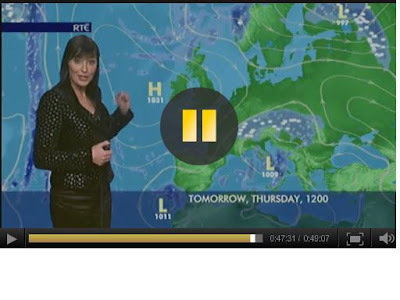 I'm going to give Jean Byrne, one of our weather girls, a category all of her own. Last night, Brendan called me down just to see what she was wearing - we spent the whole 3 minutes discussing her outfit and forgot to listen to the weather - it was a figure-hugging black PC dress, with a furry scarf and a pendant hanging at tummy level. What other country can boast such a wild look for their weather girls, hey? She's got the figure - slim waist, nice breasts - she is big-boned, but she is fit.A bit like Xena Warrior Princess, don't you think? But some of the clothes she wears are so mad I'm going to have to start recording them here! She is one confident lady! I suspect that the furry scarf was a last-minute panic by the RTE producers to hide her cleavage. Like some days she wears this vile bright yellow bolero - I'm convinced it's because her bosses don't want her to go on the telly with bare arms. She would look much better without those accessories. Susanne and I went to the opera last night - plenty of drama before the curtain rose, but all ended well, with a little help from friends, neighbours and cleaning ladies! Opera Ireland's production of Gounod's Roméo et Juliette was sold out most of the nights of its short run, I think. We got seats in the Grand Circle, about 4th row and bang in the centre. Great seats, though you don't want to suffer from vertigo. And not recommended for anybody with long legs - even Susanne and I, who are not extremely tall, suffered from the lack of legroom. But a great view and the voices carried perfectly. And a great spot to admire the Gaiety Theatre's wondeful chandelier. It was a "victorian" production, apparently - all the costumes were victorian all right, apart from the last act (in which, very strangely, Roméo is wearing a hoodie, and Juliette a little cotton slip). The Irish Times had described it as "gothic" - although they define gothic as Tim Burtonesque. The set was dark, with peeling wallpaper and a big chest that was used for all sorts of purposes, including balcony and Juliette's bedroom - with a mini-bed. I found that chest a bit clumsy. One of the reviewers on The View complained about the fact that the curtains had to come down every time it had to be moved, turned, opened and closed. I agree - compare that to the production of Rigoletto of a good few years ago, where a swooshing curtain was enough to take you from the dark street into Rigoletto's home - light and breezy and imaginative. And Roméo was too fat - sorry Michael Spyres! He did have perfect French diction, though, and sang and moved nicely, except when he was wearing that hideous hoodie. You must think I hated it - far from it. I really enjoyed it. Nathalie Manfrino sang Juliette very nicely - a powerful voice. And from a distance, I think she did look young enough to play 16-year-old Juliette. The music and singing was of a high standard - Marcel Vanaud sang a convincing Count Capulet, with perfect diction too (but then again, being Belgian, that shouldn't be too hard for him!). The lighting was good, and added to the dark atmosphere. Photos and comments on Opera Ireland's Facebook page. I had never tasted blueberry pancakes until last weekend, when Brendan decided to treat us to a special breakfast last Saturday week. Well, I hadn't lived, obviously! Drizzled in maple syrup, they were heavenly (and relatively healthy - no sugar at least - and blueberries are good for you, aren't they?). Well, we liked them so much, we had them again on Sunday, and this Sunday too. Just as well we went to the gym this morning (and we went for a walk in Marlay park on Sunday too). PS: check out the bit about Marley Grange in the Wikipedia entry - I'm glad I'm not the only one who has trouble remembering how it's spelled. If you're a fan of Aine McAteer and you're looking for her website, you can find her recipes and weekly blog on www.oprah.com/ainemcateer. Plenty of yummy recipes and inspiration (I love her radish pickles -radishes in umeboshi vinegar- really sharp and refreshing!). I baked her choc chip cookies 2 weeks ago, and her apple & pear crumble yesterday. These are my 2 staple recipes (from Recipes to Nurture). Not a big repertoire, but they are so delicious that I could eat these forever (and never shift that little bit of holiday weight - ah well!. It's all healthy is what I keep telling myself as I bite into another cookie).